Wondering what all the clatter’s about when it comes to modern home design? Well, in many cases, it’s the clatter itself. Today’s new homes, with their open-concept designs, quartz countertops, tile and hardwood floors, high ceilings, TVs mounted on walls and large floor-to-ceiling windows, are being embraced by builders, architects, renovators and homeowners alike for their clean, modern and minimalist ambience. But while these designs are pleasing to the eye, they are not necessarily pleasing to the ear. A few decades back, heavy drapes on windows, carpeting on the floors and bulky furniture did much to deaden echoes in large rooms and suppress noises from other parts of the house. By contrast, modern open-concept design and bare floors promote echo-y spaces and room-to-room noise, with little regard for acoustics. And the problem isn’t just noise inside the home. With developable land becoming more scarce, new homes, townhouses and condos covered in more exterior glass are being built close to busy streets, highways and industrial areas. As a result, our homes are not always the quiet havens of yesteryear. While the current code does not address residential exterior noise, it does contain a minimum requirement for sound transmission in walls separating multi-unit residential buildings (condos and townhomes) and hotel suites. Nicholas Sylvestre Williams is an acoustical consultant and principle with Aercoustics Engineering in Mississauga, whch has specialized in acoustic design, noise control and vibration control for more than 40 years. Williams claims to get at least one call a month from condo owners asking if his company can come over to test for noise from neighbouring units, and tell them what can be done about it. “To understand noise, you need to understand the concept of sound transmission,” explains Williams. “It’s more than just a heavy-footed neighbour. The overall amount that a wall will reduce sound is called a Sound Transmission Class (STC) rating. The higher the number, the less sound is transmitted.” But a high STC rating does not necessarily guarantee less noise, according to Williams. Sound travels through the air from one room to another, but it is also transmitted through walls, ceilings and floors. This is called “flanking” noise, which STC tests do not take into account. The existing National Building Code of Canada calls for a minimum STC rating of 50 in walls separating townhome and condo units. Recent changes in the national code, expected to be implemented by the provinces, have added an additional noise rating, Apparent Sound Transmission Class (ASTC)—a more realistic measure of the actual sound transmitted between occupants, since it includes noise through walls, ceilings and floor junctions. Now, in addition to an STC in walls of 50, adjacent units in multi-residential buildings must be separated by a wall, floor or ceiling with an ASTC rating of at least 47. Williams advises that much can be done by builders to minimize noise—between units and rooms, as well as from the outside. “With acoustics, the devil is in the details,” he says. “Use your ears. Where could noise potentially come from? It could be in walls, ceilings or even HVAC systems.” Small steps, like carefully sealing gaps and cracks in walls, avoiding back-to-back electrical outlets and allowing for air space in the ceilings between two living spaces can go a long way to reducing noise, Williams adds. As to flanking noise transmission in walls that separate units or rooms, Williams recommends gypsum wall assemblies using resilient channels. It’s a system that uses sound-dampening metal strips (also called sound bars) screwed into wall studs, to which a layer of drywall is attached, helping increase sound isolation by acting as a divider that prevents sound vibrations from travelling from the drywall through the stud. Further, installing loose, flexible insulation (fibreglass or mineral fibre) between walls will add greatly to the sound-blocking effect. Construction Canada’s website, however, cautions that a resilient channel wall assembly is more labour intensive and therefore more costly, and also increases the footprint of the wall, reducing a floor plan’s useable square footage. And if not installed precisely, it can actually make the noise situation worse. Instead, the site recommends noise-reducing laminated core gypsum board, which can be secured directly to studs, saving time and space. Williams identifies glass as the weakest link when it comes to addressing exterior noise. “New residential buildings today offer a 45 to 50 STC rating. With windows, you get 20 to 30 STC,” he says, recommending options to help, including double-pane glass with a larger air space between panes; laminated windows with a protective vinyl layer of material inside of two pieces of glass; as well as windows with two different thicknesses of glass to block different noise frequencies (manufactured by Jeld-Wen, among others). Williams believes that these windows offer better sound insulation than triple-pane glass, which, he notes, are designed primarily for superior climate insulation. How much extra will it cost builders to utilize these steps and products in order to meet the residential multi-unit noise requirements of the new national code? For material only—underlayment between floors, wall and ceiling resilient channels, acoustical strips under drywall where it meets the floor, acoustical caulking between drywall joints (wall and ceiling), duct and pipe wrap material, as well as acoustical putty around electrical outlets—Williams estimates an average premium of $3 to $4 per square foot. Installation costs, on the other hand, would depend on the size of the project. Acoustic windows (not required by the new code), would cost from $1,000 to $2,500 total, based on typical residential sizes. Row townhomes present another noise problem: so-called “party walls” that separate units from each other. Liteblock, a cellular concrete product relatively new to Canada but established around the world, is manufactured by Litebuilt Concrete Canada. It’s made from a concrete slurry expanded by air injection to create insulating air pockets, much like an Aero chocolate bar, then formed into lightweight, 5”-thick mortarless interlocking building blocks. The product is primarily used to separate attached units in mid-rise wood-frame projects, offering both fire protection and sound insulation. According to Litebuilt G.M. Stephen Baker, the product (along with half-inch drywall on top) provides a separating wall STC rating of 52. If acoustic batt insulation is also added, builders can achieve an STC of 65 or better. “The average cost of supplying and installing Liteblock is about $10 per square foot,” Baker says. “When implementing it into two-hour fire walls, builders can actually save 35% on the construction, because these types of walls require multiple fire-rated products to achieve the fire rating. Using Liteblock, you can achieve a fire rating of up to five hours while saving a lot of money (and space) in the wall assembly.” When it comes to new detached and semi-detached homes, better exterior climate insulation and more energy-efficient window products come with the added benefit of improved sound insulation from outside noise. There are several products and building systems available to builders who want to offer clients a quieter living environment. Owens Corning’s EcoTouch Quiet Zone Fiberglas acoustic batt insulation is designed to control noise by absorbing sound vibrations transmitted through walls, interior partitions, floors and ceilings. Made of 73% recycled content and formaldehyde-free, it can be installed in stud frames in masonry units, stairwells and service rooms, as well as between joists in floors and ceilings. Similarly, Roxul Safe and Sound provides an open and porous mineral fibre insulation that easily fits into wall, ceiling and floor applications, offering great acoustical dampening. Window fashion manufacturer Hunter-Douglas, meanwhile, claims that all of its products absorb sounds to various degrees. Flooring manufacturer Mohawk’s latest product, Air.o, designed for application on wood or laminate flooring, is a hypoallergenic carpet featuring a high-grade attached felt underpad made of 100% recycled water bottles that offers a soft, easily-cleaned, sound-absorbing surface. And new assemblies for wood, laminate, tile and carpeted flooring installations touting a reduction of noise transfer between floors include acoustic underlayment products from such companies as AcoustiTech and Amvic. Another noise-mitigating option for a home’s exterior and interior is Icynene, a one-step spray foam insulation and air barrier system that insulates from climate and sound. A closed-cell version called Classic Plus, which expands 100% to fill every corner of the building envelope, is used in continuous exterior applications. An open-cell version is used in interior cavities. Duffy adds that acoustic insulation is especially important in party walls where, in addition to spraying cable outlets and plumbing, a multi-layered application of Icynene product is used to create “dead air” spaces to deaden sound. Sometimes it’s a combination of innovative products and creative problem solving. The use of sound-isolation clips, for example, has almost become the standard for Rick Martins, V.P. 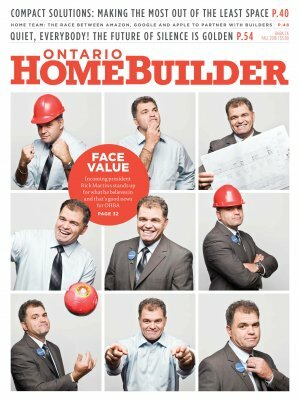 of Huron Creek Developments and incoming OHBA president. Martins’ company regularly uses Regupol SonusClips to attach gypsum wall board to interior walls and ceilings. Essentially little rubber shock absorbers, they’re designed to reduce airborne and impact sound transmission, and can be used in wood, steel and concrete construction. Each SonusClip has a design load rating of 36 lbs. and can support up to two layers of 5/8” gypsum board when spaced no more than 24” x 48” on-centre. “It’s something they’ve been doing for years in the commercial industry, but which has never really crossed over into the residential industry due to price—it’s about $1,000 a unit,” explains Martins. “But, truthfully, that $1,000 helped sell me 40 stacked units in my next site. And it’s not really $1,000, because instead of having core slab, I’m dealing with wood structure, putting a Gyp-Crete concrete slurry coat on top of it. Core slab is great, but you get that tapping noise all the time—if someone upstairs is wearing high heels, with ceramic or laminate flooring, it drives you bananas the floor below. “Sound is going to be a big deal in the future,” says Martins. “Our STC is 60, and every decibel of difference is huge. In an era where silence is golden, sound thinking like this will surely perk up the ears of potential clients.